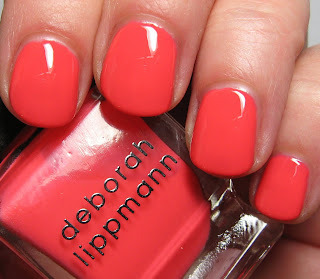 Deborah Lippmann has four new fun and flirty colors for Spring and Summer, and today I have swatches of two of them, Girls Just Want To Have Fun and I Know What Boys Like. Below is a look at all four shades, followed by their descriptions. Girls Just Want To Have Fun - A smooth, vintage coral that everyone can wear because it’s bold yet velvety – a sort of carefree, creamy coral. I Know What Boys Like - A creamy periwinkle that credits to both the 80’s and my clients. Several of my clients have asked for interesting blues. This one is a blend of blue and purple with a creamy finish, which gives it a slightly retro look that is so playful and hip. Yellow Brick Road - a sheer mellow yellow with a jelly finish. The proof that it wears beautifully on all skin tones: it complements me and Lady GaGa, who wore it first for her “Born This Way” performance at the 2011 Grammy Awards. Lara’s Theme - was created with supermodel Lara Stone is Deborah Lippmann’s newest celebrity collaboration. It’s a dare to wear shade of hot-hot orange. 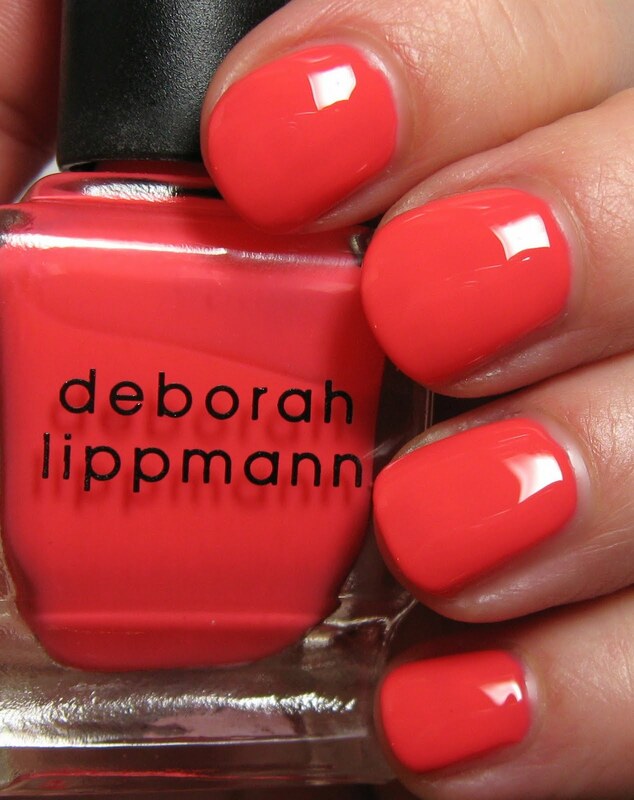 Here's a look at Girls Just Want To Have Fun, a bright creamy coral shade. This bright melon cream shade has just a hint of pink, making it a perfect coral shade. The first two photos were taken indoors with an Ott lamp, and the third picture was taken outdoors, just as the rain started. I Know What Boys Like is a unique periwinkle blue cream. This has a very high gloss finish, and while not as bright as a royal blue--which is actually why I love it, there is a slight dusty element to this shade. Again, the first two photos were taken indoors with an Ott lamp, and the last photo was taken outdoors under heavy cloud cover. I love both of these shades, and they are the typical Lippmann formula: extreme perfection, 2-coat coverage, and a beyond exceptional ease of application. If you asked me what my favorite polish brand was overall, I'd probably go with Lippmann. From the heavy architectural bottles, to the consistent without being predictable shades and finishes that she continues to release, to the quality formula, it's all there. There was only one time that I was disappointed by a polish from this line, and you can probably guess that it was Funky Chunky. I thought the concept was very interesting, but I just couldn't get that one to perform for me the way I wanted it to. No disappointment with today's shades though! They're fabulous for the season. Do you have any favorites from the Spring/Summer Shades? *Products featured were furnished by the manufacturer of PR firm. I've only gotten glitters from Lippmann so far, but that blue might need to come live with me. That blue is gorgeous! I might have to pick it up... Have you tried out Yellow Brick Road yet? That's the other shade I had been eyeing besides I Know What Boys Like. Thanks for sharing swatches! The orange is so goreous!! I love I Know What Boys Like!! Gorgeous!! They're all lovely shades. Love that coral & periwinkle. 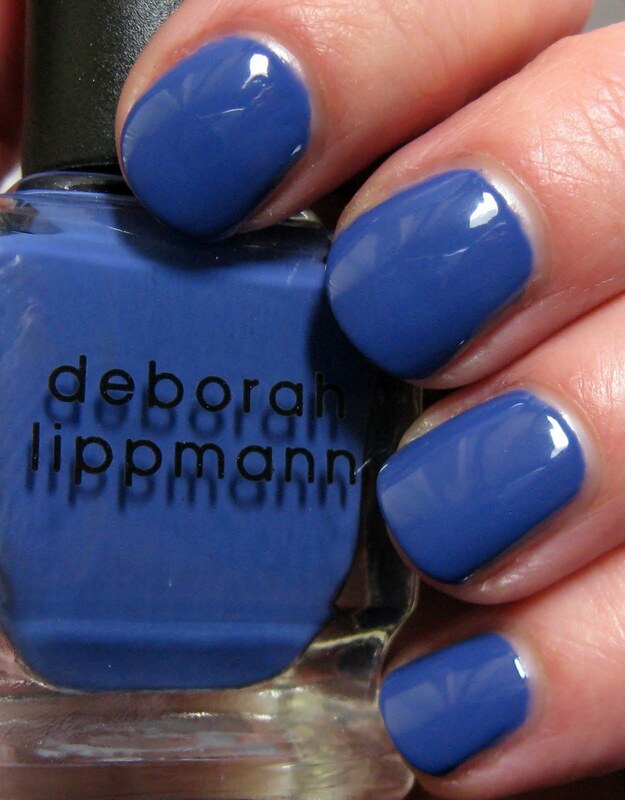 Have a sale Deborah Lippmann! Don't even get me started with Funky Chunky!!! I Know What Boys Like looks pretty similar to American Apparel Mount Royal. What do you think? Did you change your mind about Marquee Moon then? I thought that one was kind of a fail for you too.